If their latest single, "Windows Down" is any indication, Big Time Rush is not your average boy band. Sampling Blur's famous guitar riff from "Song 2, "Windows Down" is upbeat and sounds like it should be blasted on the dance floor. The song undoubtedly appeals to a larger audience, which means that people outside the band's target demographic will enjoy their show at Summerfest. Big Time Rush will headline the Marcus Amphitheater on Friday, July 6th as a part of their The Big Time Summer Tour. 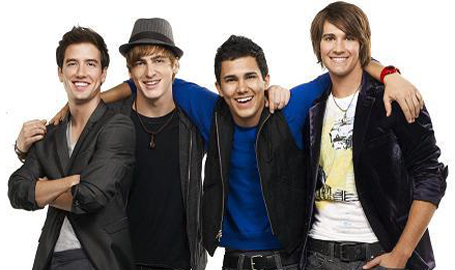 Big Time Rush Summerfest tickets are still available from Ticket King Milwaukee. In case you didn't know (or have forgotten), Big Time Rush got their start on Nickelodeon on a TV series of the same name. They released their second album at the end of last year and have since gone on to sell over 3.5 million copies of their singles. They're currently working on the 3rd season of their show and subsequently their 3rd album. Expect to see that album at the end of this year or the beginning of next. Often compared to fellow boy bands, One Direction and The Wanted, Big Time Rush is looking to make their mark in the world of boy bands.